The week between Christmas and New Year’s is wonderfully hectic – visits from friends and family, delicious holiday meals and thoughtful gifts to share. These magical gatherings have their own tastes and smells, transporting us to our childhood and helping us to reconnect with the important people in our lives. For many of us in New Hampshire, it’s the taste and smell of maple that brings us home. A touch of maple syrup can take a dish from good to fabulous. 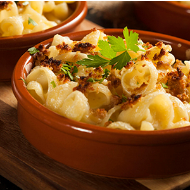 A casserole recipe that is always a crowd-pleaser is Maple Bacon Mac & Cheese from Fuller’s Sugarhouse. This savory, sweet, cheesy combination is the ultimate comfort food for the holidays. While selecting a grade of maple syrup is often a matter of personal preference, it’s best to use “Grade A – Dark Robust Taste” maple syrup (formerly known as Grade B) in cooking. You’ll enjoy a rich maple flavor that complements the smokiness of the bacon. For the cheese, we recommend an aged cheddar, such as Cabot Artisan Reserve Cheddar from The Cabot Creamery Cooperative. Many small New Hampshire family dairy farms supply milk to Cabot, which has achieved B Corporation Certification for its environmental and socially responsible practices. You can find many local sources of maple syrup, cheddar and bacon just by searching our NH Made Member Directory. 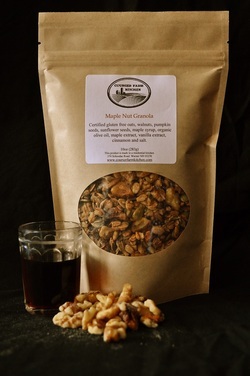 For a healthy breakfast or afternoon treat, check out Maple Nut Kitchen, which makes granola sweetened only with maple syrup. All thirteen flavors are handmade in a dedicated gluten free facility, using only the best ingredients. They also come in pouches so they’re the perfect snack for long road trips in the car to visit grandparents and cousins. 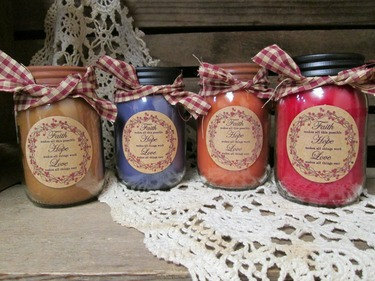 Stepping out of the kitchen, you can layer scents throughout your home with candles and room fresheners. NH Made member, KKE Candles and Gifts, makes Maple Cream, Maple Hot Toddy and many other whimsical scents to set the perfect mood for your guests. They’ll think you baked all day! Another way to make your guests feel welcome this week is to refresh your bedrooms and bathrooms with new linens, lotions and soaps. Visit a gift shop in your neighborhood to find local products that can help you create the feeling of a New Hampshire getaway. Look out for Misty Hill Farm Goat’s Milk Lotion in New Hampshire Maple scent. Many stores now carry a wide assortment of sample sized lotions, shampoos and soaps so you can create a small take-home gift for your guests to remind them of their holiday with you. Wishing You a Merry Maple Holiday and a Happy New Year! 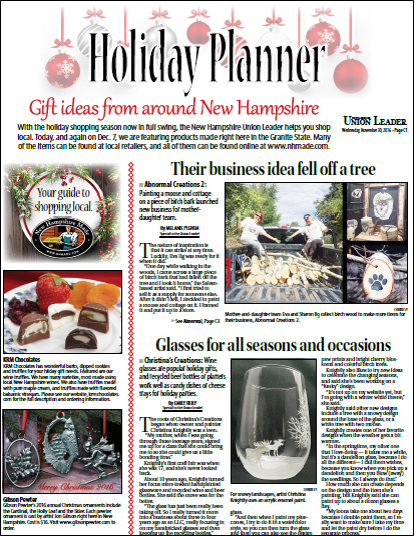 Each year, The New Hampshire Union Leader and NH Made partner together to help you shop local during the holidays. 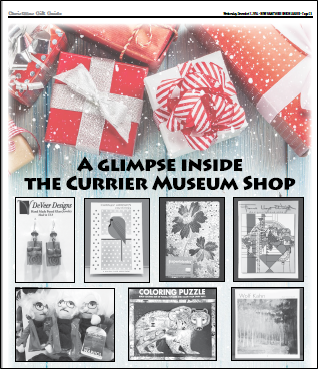 In the November 30th print edition, The Union Leader published their annual Holiday Planner featuring over 60 NH Made members and events going on around the state. On December 7th, they also released their Christmas Gift Guide. These guides profile jewelry and wood artisans, glass artists, specialty food companies, toy makers, pet treat producers, gift basket sources and more. Many of them have online stores so you can shop from anywhere. We hope these guides make your holiday shopping experiences more joyful and that you’ll discover some new finds that you’ll want to support all year long.